There is no default or inherent functionality in WordPress which allows users to integrate a login page to their website. However, it can be easily managed through the use of WordPress plugins. Having a WordPress social login page can be very handy. Not all your readers will wish to sign up to access some of your content or services which you have reserved for members. This is because the signup process is a bit tedious, and most people don’t like to go through with it. However, if your login page supports social login, then your visitors can sign in quickly with one of their social networking accounts. This makes it a win-win; you get more sign-ups, and your visitors don’t have to go through the hassle of entering their details. This method also saves you from the potential problem of users inputting a false/invalid e-mail ID. Now, as we said, WordPress has plenty of plugins which can help you implement social login into your website. We have hand-picked few of the best and most feature-rich WordPress social login plugins of 2019. 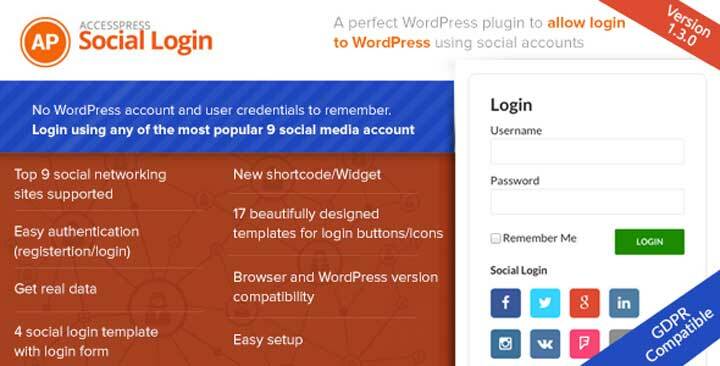 Kicking off our list, we have the famous and influential AccessPress Social Login plugin for WordPress. With the plugin installed, your visitors will be able to register/login to your website using one of their favorite social website accounts. The plugin supports login functionalities with 9 of the most popular social media networks. You also have complete control over which social accounts you want to enable or disable for login. The functionality is also not restricted merely to registrations and logins. You can also configure the plugin such that users will be prompted to social login while commenting or checking out. You will even get access to 17 different beautifully designed templates for designing the social login buttons and icons for your customization preference. Other features include shortcode and widget support, ability to send login details to a user’s email address, integration with WordPress users, and also BuddyPress compatibility. Next up we have WooCommerce Social Login plugin. As you should know by now, WoooCommerce is an e-commerce platform for WordPress. This plugin is an extension of the WooCommerce plugin which allows your customers to register with their social media accounts as they check-out from your WooCommerce store. This makes the whole transaction much more straightforward for your users and helps you increase your sales figures. The social login buttons are placed on your site using shortcodes. Once a user creates an account, you can send newly created account details directly to their email. This social login WordPress plugin offers a whole variety of social login solutions which starting with the popular ones like Facebook, Twitter, Instagram, and Google+ to even with your Windows, Amazon, or PayPal account. You will also get a detailed overview regarding which social network is most used by customers for login purposes. There is also an Account management tool for your customers from where they can link or unlink their social accounts. BS Input plugin for WordPress helps you integrate a social login and register popup functionality to your site using Shortcodes. It is one of the simpler and easy to use options on the list. Without burdening you too many useless options, the plugin has support for 4 of the most popular social networking including Facebook, Twitter, Google Plus, and LinkedIn. It also supports WooCommerce and BuddyPress, and you can extend the social login features here as well. This WordPress social login plugin allows you to protect some of your content with a social login prompt. It supports shortcodes which enables you to place the social login form on any custom page and even in the widget area. Feature-wise; you will get access to 2 different social button styles as well as the option for a custom background color or image. You also have the opportunity to make things more appealing with six different animations for popup models. 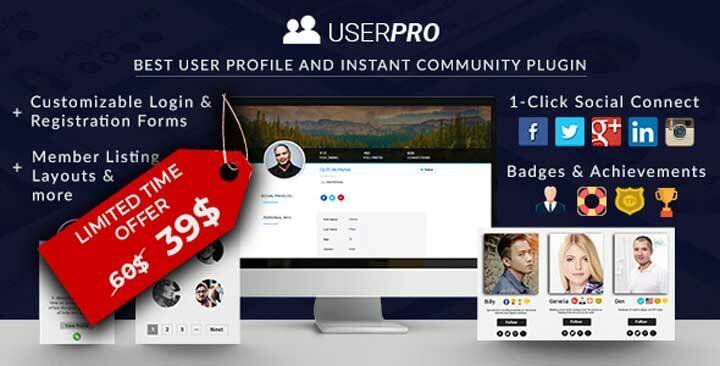 UserPro isn’t particular curated as a social login plugin, but instead, it is more of a community and user profile plugin for WordPress websites. It allows you to give your users a rich experience as they become a member of your site and become a part of the community. With that being said, the plugin does allow your users to register and login to your account with their social media profiles. 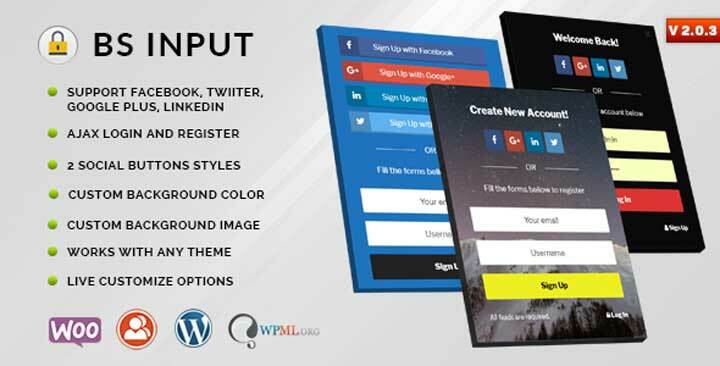 This social login WP plugin is on the expensive side and packs in a lot of advanced functionalities that will help you set up a great user experience for your users. But here we are mostly focused on the social login functionalities the plugin has to offer. You can provide your visitors with the option to fill out a registration form, or seamlessly connect to your site using Facebook, Twitter, Google Plus, Instagram or VK. The plugin is also compatible with WooCommerce and BuddyPress, and the social login functionality will extend to here as well. As the name implies, WordPress Simple Login Registration is a simple social login plugin, which you can install to integrate the functionality to your WordPress website. It supports three social networking profiles, namely Facebook, Twitter, and Google. Visitors who have accounts on any one of these three networks will be able to register and login to your website with a single click. The social login pages are placed using shortcodes and widgets. On top of the basic social login feature, it adds in a lot of other options to help you better manage your users. For example, you can limit up to a single registration per IP address as well as block certain IPs from registering to your site. You can also allow your users to register the traditional way, with an email and a password if they don’t like social logins. On the customization front, the plugin supports custom CSS which can help you make certain appearance tweaks here and there. Here is another registration plugin for your WooCommerce powered WordPress website. This is also not a plugin which strictly focuses on merely the social login functionality but helps to expand the entire registration process on your e-commerce website. Besides allowing you to enable social login to your site using Facebook and Twitter, the plugin also helps you to add a lot of extra custom fields to your registration form. Starting from basic text fields to checkboxes, date pickers, and more, the plugin will help you build a wonderful registration form. You can also add conditional fields if you like. However, if you feel that you might be losing customers due to the cumbersome registration process, then there is always the handy social login functionality to help you out. Another notable feature would the handy Google ReCaptcha option to limit spam registrations. Now coming to the final premium social login plugin for WordPress we have User Signup for Arforms. 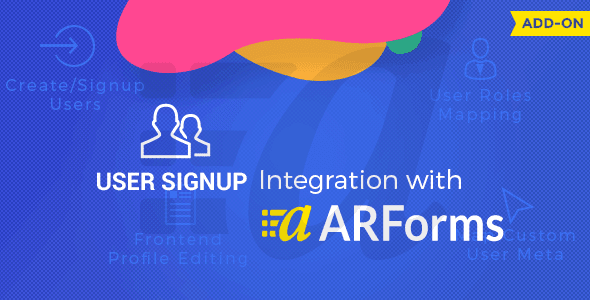 This WordPress social login plugin is an add-on for the popular WordPress forms plugin – Arforms. With the plugin installed, you will be able to create beautiful forms for user registration and add a social login option for the convenience of your users. This WP plugin support only the top 4 social media networks, namely Facebook, Twitter, LinkedIn, and Google. 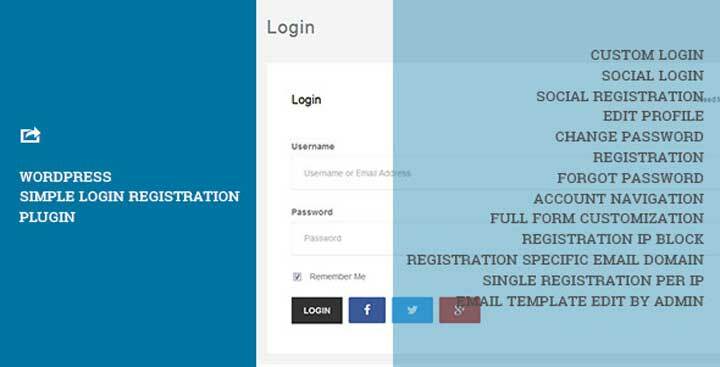 Now, this plugin is mostly about creating beautiful looking registration forms and similar stuff for your WordPress website. However, if you already have Arforms installed on your website and wish to implement a social login functionality to your site, then this WordPress social login plugin is the most obvious choice to make. You will also get a few customization options that extend to customizing the social login buttons. And now to start our list of free social login plugins for WordPress, we have the appropriate named – Social Login. If you wish to give your users the freedom to choose any social media platform for registering with your website, then this is the ideal plugin for the job. It has support for up to 30 social networks, big or small, to lay in front of your customers. The use of the social login option is also not merely limited to the registration page. You can even have your visitors sign in with their social accounts when they are commenting. There is also the option to keep the social login form passively in the sidebar with a widget or practically anywhere on your website with shortcodes. Next up, we have WordPress Social Login plugin developed by miniOrange. The plugin doesn’t merely help you to set up a social login functionality on your site but also allows you to integrate a social sharing option. If a user logs into your website with their social account, it only makes sense to allow them the option to share your content with their friends on the social networking site. The plugin can also help you integrate the social login option for users who wish to leave a comment on your website. This WordPress social login plugin has support for all the popular social networking platform. You can just set up the social login buttons which you think are most likely your userbase is going to use. You also have the option to customize the button styles to suit your websites aesthetic. Other than this, the plugin has support for WooCommerce, BuddyPress, and bbPress. Email support is also available. WordPress Social Login by Miled is one of the simpler and easy to use social login plugins in this list. It doesn’t pack in a bundle of unnecessary features and helps you to set up a social login functionality for your visitors. This makes it ideal for beginners who don’t wish to get overwhelmed with too many options. However, there is this one extra functionality which allows you to import all your contacts from social media sites like Google, Facebook, Windows, and LinkedIn. As of now, the plugin is supported by a whole variety of different social media networks big and small. So your customers will feel marginalized. It is also easily customizable and will help you to build a social login form which matches your site’s design and is brandable. Nextend Social Login is one of the most popular Social Login plugins for WordPress which you can get for free. However, it is not entirely free and follows a freemium model. Most of its features are accessible without any cost, but some advanced functionalities are reserved for the pro version. But here, we will be only going over the free features. After the plugin is installed, the social login feature will seamlessly integrate itself with your existing WordPress Login and registration form. The buttons are easily customizable and have support for widgets and shortcodes which allows them to be easily placed anywhere on your site. As of now, the plugin only supports three of the popular social networking profiles: Google, Twitter, and Facebook. Once a user has logged in, their social media profile pic will be used as their avatar on your site. Super Socializer is another social login plugin for WordPress which offers a super simple and easy means for adding social login, social sharing, and social commenting features to your website for free. There are also a lot of button customization options, so you don’t have to worry if the default option doesn’t match your site’s theme or design. In total, the plugin supports 100 different social networks, and you will be able to set up social share options for all of them. Furthermore, there is also the option to enable share count cache which will help you to showcase how many times a post or content has been shared. There are also many more small features that the plugin brings to the table which makes it a total steal – even if it is free to use. We have talked about the premium version of this plugin above, and now, here is the free version. Some good features have been stripped down to accommodate with the free pricing, but what you get is hardly disappointing. For starters, you get support for the three of the most popular social networking platforms, Facebook, Twitter, and Google. You also get a heap of customization options with which you can tweak the social login buttons. And this is mostly it for the free offering. And if you are interested, there is still WooCommerce and BuddyPress support with the free version. 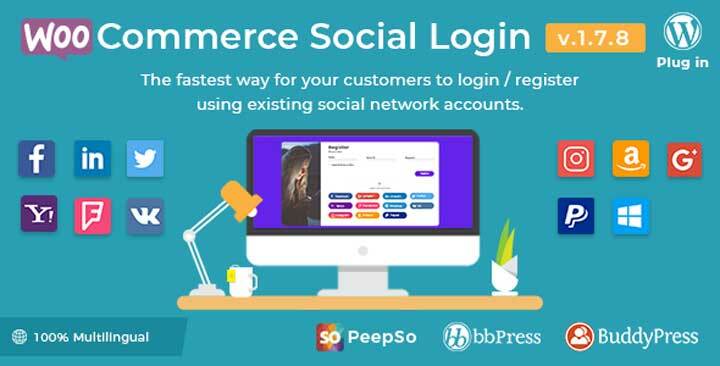 This is a free social login plugin for your WooCommerce website. The plugin will help your customers to log in using their social media accounts and then make purchases from your site. So instead of having to fill up a long form, customers can conveniently log in and make purchases with a click of a button. It is only limited to three social media networks: Facebook, Twitter, and Google Plus, but luckily these three are the most popular ones on the market. Once you have installed the plugin, a social login button will be automatically added to the My Account page, checkout page, and even in the WordPress login page. The last entry in our list is yet another social login plugin targeted at WooCommerce powered WordPress websites. Now, as you might have guessed from the name, it is the lite version of a premium plugin which has more advanced features. But all the functionalities you get with free version are excellent as well. Your customers will be able to login to your e-commerce website with their Google plus or Facebook profiles. The social login buttons can be added to your login page, registration page, and even your checkout page. You can also customize them by uploading an icon of your preference to the site. Also, once the user has logged in to your site, a new login ID and password will be generated and sent to the user’s mailbox. And lastly, the plugin will also give you access to a detailed report on the number of connections that you have received from Facebook and Google + distinctly. Any Other Social Login Plugin for WordPress? So these were our picks for the top Social Login plugins for WordPress. We hope you found this list to be helpful. If you already use one of the plugins we have mentioned here, then don’t forget to leave a comment down below about your experience using it. Your fellow readers to love to receive an input from you. Also, if you know or currently use a social login plugin for WordPress which is excellent in performance but left out from the list, then mention it in the comment section. Everyone loves to have more options, and it will help expand the scope of this read.